SMS text messaging has been around for a long time and is supported by most communication devices including feature phones which may not have the ability to install mobile apps. Text messaging may incur a charge from the user's mobile service provider and requires implicit permission from the user in order to send them because of the possible additional cost. Sending text messages also incurs an additional cost to your existing DimDrop subscription. One benefit of text messaging is that your user does not need to have a mobile app installed on their device in order to receive messages. This gives you options when sending important alerts. SMS text messaging has been around for a long time and is supported by most communication devices including feature phones which may not have the ability to install mobile apps. 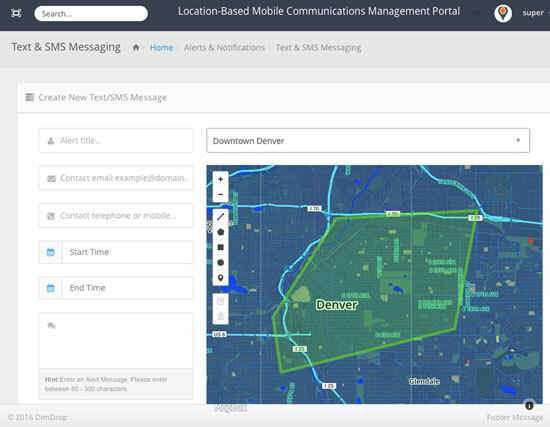 As with push messaging, you can target groups of users and/or specific geographic groups. Text messaging may incur a charge from the user's mobile service provider and requires implicit permission from the user in order to send them because of the possible additional cost. Sending text messages also incurs an additional cost to your existing DimDrop subscription. One benefit of text messaging is that your user does not need to have a mobile app installed on their device in order to receive messages. This gives you options when sending important alerts.